Steer List, developed by Doreen Theverapperuma, a frustrated (and occasionally forgetful) mom, Steer List is the free app that uses a Geo Location function to remind you of what you need to do as you near a set location. Its very simple to use, create a shopping list and tag the store in which you need those items, and pick the day you’d like to make sure you stop by that store. Then forget about it. Steer List is very simple to use and when you first launch the app it will go through some basics tips just to make sure you have a grasp on how the app works. Just click on list, set a location by searching for places or an address. Once you have your desired location you can adjust the proximity to the location from 0.3 miles to 3 miles. Once you are in the proximity you will get a notification that will remind you to complete your task. Steer List can be used for a ton of different things like reminding you to pick up certain groceries at a certain store like an organic store. You could also use the app to remind you of other tasks like picking up your pictures you just had printed. Just set the location and date and Steer List will be your personal assistant. Overall I would have to say that Steer List is an excellent location aware reminder application. It is designed very well and easy to use. The one downfall it has it that you can only have 3 locations set, but I am sure the developer will add an option to add more in the future. For accurate location reminders, Steer List uses GPS for lists which are active for that particular day. If there are no active lists for that day, GPS will be not used. When the App goes to background, GPS Geo Fencing will start monitoring for set locations in your active lists. Please note that continued use of GPS running in the background can dramatically decrease battery life. Steer List, the location and data baed reminder app is currently FREE on the Apple App Store. 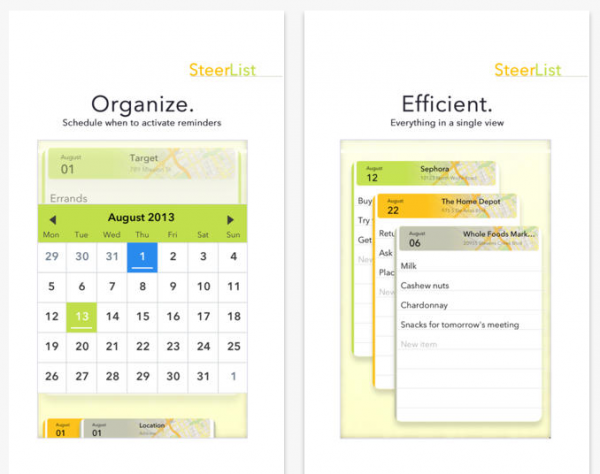 If you need to combine tasks and locations from a single app, make sure to check out Steer List!